This orange-colored spice blend has been perking up salads, pasta, potatoes, hamburgers, and vegetables for years now, but there has never been a home clone for the stuff. Time to change that. While it's obvious that sesame seeds are a major part of this blend, you may not know that the main ingredient is Romano cheese—in the bottle it's tinted orange by the paprika. Be sure to store this one in the refrigerator. 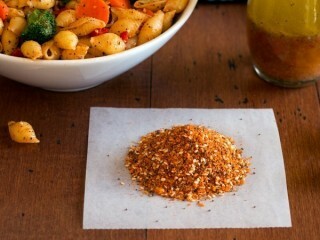 You might even want to keep the seasoning in an empty shaker-top spice bottle. And if you're in the mood for some tasty pasta salad, just check out the Tidbit below that comes right off the bottle of the original product.